Peripheral Neuropathy affects sensory motor and autonomic nerves. Loss of protective sensation (LOPS) is the most significant predictor of diabetic foot ulceration. Assessment of LOPS is easily accomplished, by the clinician or patient/family, with an easy-to-use screening implement called a monofilament. 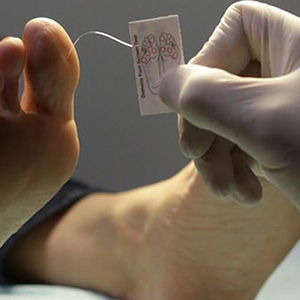 A 5.07 Semmes-Weinstein monofilament is specified, which is calibrated to apply 10 grams of force when pressed against the foot. This monofilament is recommended by the American LEAP program (Lower Extremity Amputation Prevention) and in Canada by the Registered Nurses Association of Ontario guidelines.